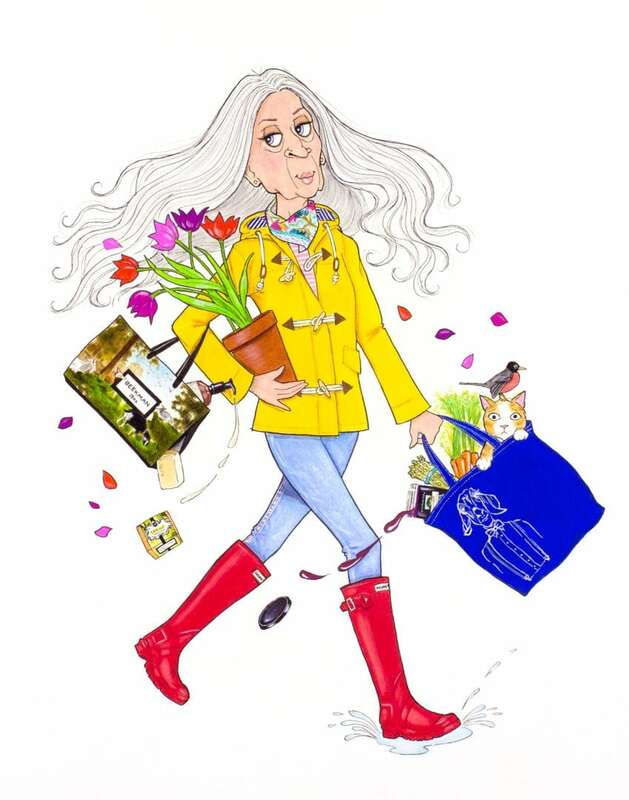 Darlings, I’ve officially waved goodbye and said “good riddance” to the cold weather and welcomed—with a toast of chardonnay—the arrival of spring. Oh the places to go and the things to do! I’ve packed up my heavy dark knits and down coats, and I’m ready to take a light, bright approach to spring. When I took a good look at my spring and summer wardrobe, it occurred to me I didn’t have any utilitarian items I was excited about. Sure I had plenty of “lunch at an outdoor cafe” and “weekend at the coast” ensembles, but what I needed were pieces that made me feel put together for a trip to the farmer’s market or the garden shop. I want classic wardrobe staples that work year after year. When I spied this cute toggle coat by Boden, I was inspired by the bright yellow raincoats I loved as a little girl. It’s so fun and bright and I adore the striped jersey lining. Fully waterproof, the Whitby jacket is a classic you can pull out year after year. After wearing dark denim and black jeans over the winter, I wanted a lighter wash denim for spring. Another fabulous pick from Boden were these cropped Salisbury side split jeans. With a versatile mid-vintage color, these jeans have worn-in detailing and a split at the hem. The bonus is they sit right at your waist for extra comfort. If you don’t already own a pair of tall rubber boots then by all means… Do yourself a favor and get a pair! These iconic, Hunter Original Tall Rain Boots are a favorite among fashion bloggers and Instagram fashionistas. They’re available in a fabulous array of colors. After owning a pair you’ll wonder what you ever did without them! When you’re running around town doing errands, who needs fussy jewelry? Instead opt for a bandana as a statement piece and add a pop of color to your look. The Springworthy bandana from Anthropologie has a delightful floral motif that will spruce up any spring ensemble. So my Fashionable Friends, put a little spring in your step the next time you have some everyday errands to do. Think retro, think classic, and don’t forget to splash in a few puddles along the way! Love your selections and as always your work! Hi Chuky. Thank you my dear! Coming from someone as stylish as yourself, well, that’s a real compliment! You are always a fashion girl’s inspiration! I bought those scarves at ANTHRO a few months ago……I just loved them!Perfect for that drippy nose when one works in the garden as well! You are looking VERY SMART..CASUAL CHIC TODAY! I hope your weekend it FABULOUS!!!! Oh Contessa, those scarves, I know! I just love them and I do tend to wear a bandana around my neck when a scarf just feels too much. Thank you my ever so chic stylish friend! Yes, even Hildie needs a reality fashion check every now and then! Now that she has that out of her system we’ll probably glam things up a bit! Love those jeans. You’re right I need clothes for the simple everyday things that need to be done. Great ideas. Like the scarves also. Thank you Sandra! It’s true, I find myself paying attention to acquiring clothes for anything but some ho-hum necessity pieces. Yes, the scarves are really cute and I think I may even take Hildie’s advice and get myself one! Cherie! I can’t tell you how thrilled I am that you enjoy Hildie’s posts! I so agree, nothing better than those classic yellow rain slickers! That’s amazing that you have one that’s 50 years old! I do love those little scarves too and think I need to add some cute florals to my bandanas. Thank you my fashionable friend!!! I love those jeans..I might try to customise mine…. Hilda! Oh those jeans would look so cute with some personal flair! I do think they are especially cute and I find myself wearing cropped jeans practically every day in the summer. Oh Hilda, you so need a pair of colorful rubber boots! It’s true what Hildie said, you won’t know what you did without them! I love the spring weather, and I adore the yellow jacket and red boot! I’m visiting from Katherine’s Corner.